A New Zealand artist reclaims herself through the sensory joys of a Campbell River studio. I was sitting in a ceramics class attempting to blow into a hand-built vessel when the spark for glass blowing reignited within me. Maybe the flame never went out; I had merely suffocated it while prioritizing a deep connection to my children in the early years of their lives. To me, glass is an addiction, and I had to refrain completely to create space for my growing family. It was strangely easy, in the most natural way of being human, to fall deeply in love with my children while pretending I might never glass blow again. It allowed space for my family life without this career getting in the way of those tiny snuggles I could never get back later. I found glass blowing again at a small studio in Campbell River. The timing was perfect. My kids were old enough to leave me yearning for solitude and to reclaim a version of myself I’d set aside. I’d forgotten what silence was, and the 40-minute car ride to and from the studio became a time of reflection and inspiration. This new adventure in glass was meant to be, and I can’t tell you how good it feels to have found my way back. Glass, like all art forms and professions, has its own community. Tight, well established communities often have patterns that are difficult to break, leaving newcomers on the sidelines as spectators rather than participants. I was fortunate to be warmly welcomed into an amazing studio run by glass artist Bob McLeod and his multi-talented wife Shannon Proctor McLeod. The studio was previously owned by Cherie Hemmingsen in its former location on Quadra Island. When I was looking for a place to learn glass blowing in 2009 during my first visit to Canada, I had spoken to Hemmingsen but ended up at the Wanganui Glass School back home in New Zealand. How serendipitous that I now work with two of her prized assistants in the studio she helped establish. The welcoming studio has a simple magic about it, allowing me to find my glass blowing groove within its walls. The energy is light and free with just the right amount of intensity to keep my blowing fun and challenging, and my skills developing. Boundaries of the glass are pushed, and it’s always better having an assistant or two so the glass dance can be performed in its full glory. Being an assistant to another artist is a special role. You bring attachments of glass, offer heat protection, keep working paper wet, offer air to the gaffer, bring a punti to help with the glass transfer, and generally stay in the background keeping the blowing bench tidy and thinking multiple steps ahead so the process is as flawless as possible for the gaffer. 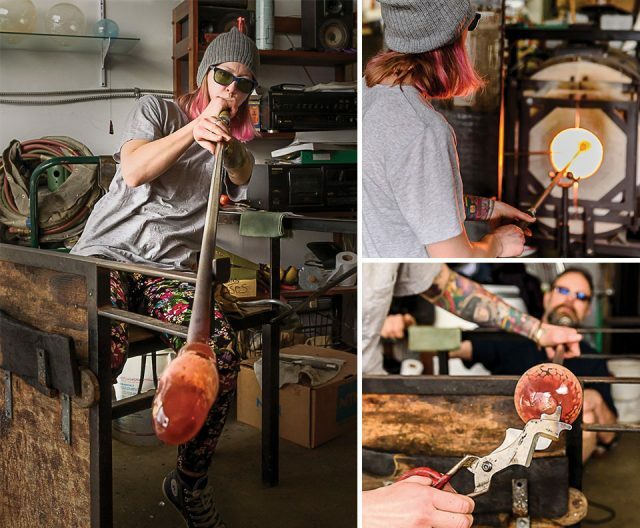 I’ve been honoured to assist many of New Zealand’s most prestigious glass blowers, including Lyndsay Patterson, with whom I was one of the assistants blowing glass for the movie The Hobbit. I was also fortunate enough to work with Canadian glass artists Julia Reimer and Tyler Rock in the small town of Black Diamond, Alberta, when I was pregnant with my eldest son. Each artist has brought their own excitement and skill set to help me learn, and I loved being part of their artistic process. There is a warmth and glow that emanates from the studio entrance (often a large factory-like roll-up door) inviting in passers-by, the smell of burning newspaper or charred wood making contact with the 1000 degree molten glass in a bid to tame it. These smells are unique to this art form. The transparent state of glowing clear glass holds the most brilliance of all, and capturing bubbles with or without the assistance of baking soda is an instant people-pleaser. The numerous applications of colour and the way it changes throughout the heating and cooling process is an art in itself. Watching a trimmed lip reveal its colours while cooling on the floor offers a glimpse of what the final product will hold. Wrapping red hot trails around a parison and feathering or cutting applications of glass for effect keep mystery in the glass; you never know the final results until the glass has slowly cooled overnight in the annealer down to about 80 degrees Celsius. 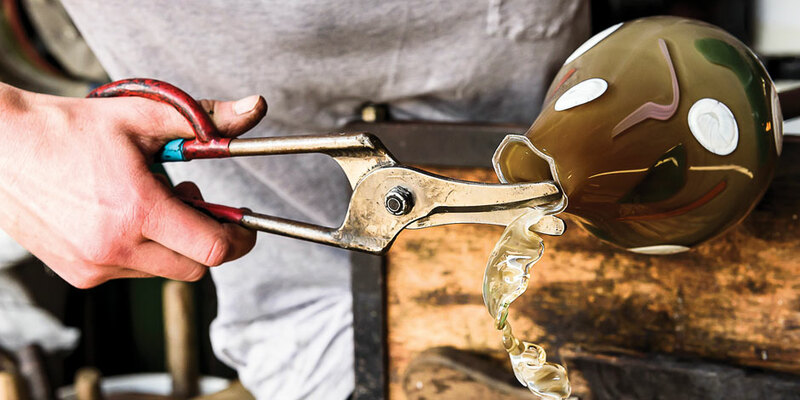 Other highlights involve the punti transfer (aka magician act), blowing a bowl onto newspaper on the ground, swinging the blowing iron to elongate the glass, or heating a bowl form in just the right way so you can quickly spin it out into the shape of a plate or platter. I feel at home and at peace while working with glass. I love using my hands to create. Holding just newspaper between my hands and 1000 degree glass allows me to feel at one with, and in control of, the medium. This writing makes me wriggle. I could be there now, hands covered in newspaper ash, a little deposit on my face, sweat dripping down my back and a burn on my arm from a brief encounter with the blowing iron that I’m barely aware of. It takes me to that place that exists only when you’ve found your passion. It keeps me there, bathing in the glory of being fully immersed and present in the process of making: of making beautiful things, making mistakes, and making masterpieces. But most importantly of all, the process of making me.